In 1904, Ota Benga, a young Congolese “pygmy”—a person of petite stature—arrived from central Africa and was featured in an anthropology exhibit at the St. Louis World’s Fair. Two years later, the New York Zoological Gardens displayed him in its Monkey House, caging the slight 103-pound, 4-foot 11-inch tall man with an orangutan. The attraction became an international sensation, drawing thousands of New Yorkers and commanding headlines from across the nation and Europe. 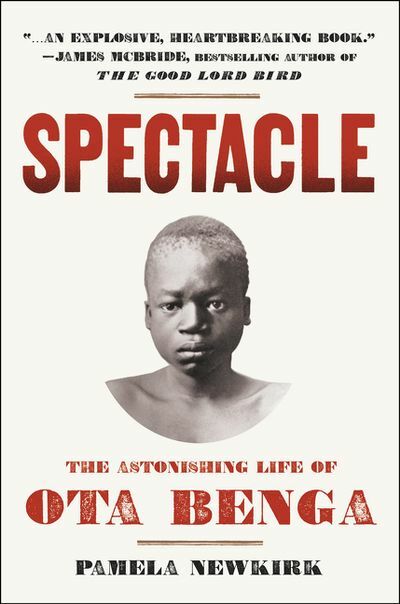 Spectacle explores the circumstances of Ota Benga’s captivity, the international controversy it inspired, and his efforts to adjust to American life. It also reveals why, decades later, the man most responsible for his exploitation would be hailed as his friend and savior, while those who truly fought for Ota have been banished to the shadows of history. Using primary historical documents, Pamela Newkirk traces Ota’s tragic life, from Africa to St. Louis to New York, and finally to Lynchburg, Virginia, where he lived out the remainder of his short life – and then committed suicide. Illuminating this unimaginable event, Spectacle charts the evolution of science and race relations in New York City during the early years of the twentieth century, exploring this racially fraught era for Africa-Americans and the rising tide of political disenfranchisement and social scorn they endured, forty years after the end of the Civil War. Shocking and compelling Spectacle is a masterful work of social history that raises difficult questions about racial prejudice and discrimination that continue to haunt us today.